Amir Khan answered his critics with a fifth-round technical decision over ring legend Marco Antonio Barrera. The 22-year-old Khan had Barrera, 35, rattled early in the first round before a clash of heads opened up a big cut high on the Mexican's forehead. It hindered his ability to box and allowed Khan to take full control of the fight from the second round. 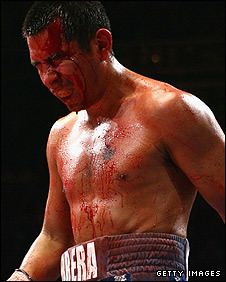 With blood pouring down Barrera's face, the fight went to the scorecards with Khan well ahead on all three. Had the fight have been stopped inside the first four rounds due to the damage caused by the accidental clash of heads - as Barrera insisted it should have been - it would have been classified as a no decision. However, the nature of the decision should not take away from what was an impressive performance by Khan, who never allowed his opponent to settle. The Bolton boxer looked composed as he entered the ring in Manchester even if the reception from his 'home' crowd was not totally favourable. That may have had something to do with the large contingent of Mexicans who had packed into the MEN Arena to follow their hero. Barrera's record going into the fight was formidable with the three-weight world champion a veteran of 72 fights. Of those 72 fights the Mexican had lost just six, winning 43 by knockout and he also famously inflicted the only defeat on British boxer Naseem Hamed in 2001. Both boxers looked calm as the first bell rang but it was Khan who exploded into life, his hand speed and accuracy proving too much for his rival. A clash of heads towards the end of the opening round rocked the Mexican. Both fighters were cut, but it was Barrera who came off worst. By the third round, he was a bloodied mess, although he showed real heart by catching Khan with a couple of punches of his own. The fourth round was interrupted when referee Dave Parris asked the ringside doctor to take a look at Barrera's cut. A round later, with Barrera in no position to continue, the contest was halted by the doctor. And with the cut deemed to have come from an accidental clash of heads, it went to the scorecards, with Khan ahead on all three (50-44 and 50-45 twice). It was a classy performance from the Bolton lightweight, who now holds a record of 20 victories, one defeat and 15 knockouts. It was also a mature display, with Khan moving away from the reckless style that saw him knocked out by Breidis Prescott in September 2008. Certainly his recent link-up with revered trainer Freddie Roach seems to have reinvented the Olympic silver medallist. So impressed was promoter Frank Warren with the performance he has now vowed to land Khan a world title fight before the end of the year. "There was a lot on his shoulders, but I always felt he could rise to the big occasion," said Warren. "I'd like to see him get a belt round his waist by the end of this year." Khan added: "I felt so completely easy, catching him with jabs. I felt like I was on a better level than him. The jabbing and patience - I felt so strong. You could see the difference. "I had to take some shots in that match. I made some mistakes in the past and I'm not going to make them again."